HOLLYWOOD—The exotic adventure stories of 19th century author Rudyard Kipling are revisited in Jon Favreau’s imaginatively shot live-action/CGI hybrid “The Jungle Book,” which also hearkens to Disney’s 1967 animated musical classic. It tells the tale of Mowgli, an orphaned man cub raised by wolves, who makes his home in the jungle in harmony with the other animals. Having learned survival skills from his wolf pack family led by surrogate parents Akila and Raksha, as well as other friendly creatures in the lush tropical realm, he also has the innate human intelligence to construct practical tools to fix or construct whatever he needs at any given moment. Mowgli has only one real enemy in the jungle, a vengeful tiger named Shere Khan, and in order to protect his wolf family, he realizes he must leave and go to the man village. 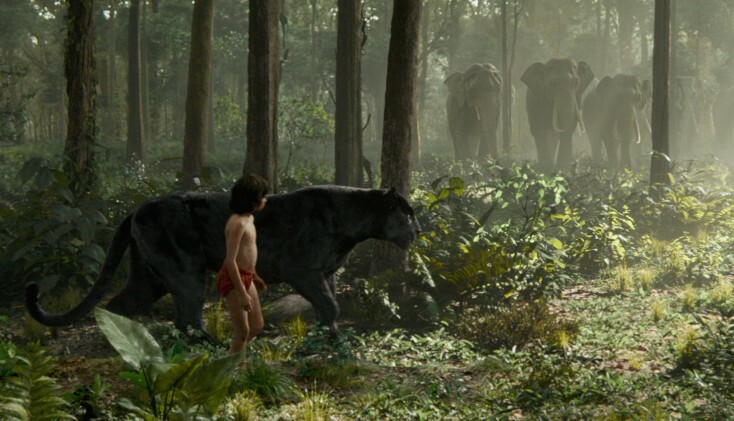 Along his journey, Mowgli meets new friends and foes. The film stars 12-year-old New York-born newcomer Neel Sethi as Mowgli, supported by an A-list team of voice talent including Oscar winner Ben Kingsley as Bagheera the protective panther, Oscar nominee Bill Murray as the fun-loving “bare necessities” bear Baloo, Idris Elba as the man-hating tiger Shere Khan, Oscar winner Christopher Walken as the Kong-size fire-craving orangutan King Louie, Lupita Nyong’o as loving wolf mom Raksha and Emmy nominee Giancarlo Esposito as steadfast wolf dad Akela. Actor turned directed Favreau (“Iron Man,” “Zathura”) explained during a recent press conference that he wanted to make a film that looked like a live action film rather than an animated one, despite the fact that it was made on a sound stage and with computer graphics. The filmmaker had to find the balance between honoring Disney’s original with creating a contemporary feature film that stood on its own. “We were going to have to deviate in some basic inherent ways from that and yet somehow preserve the soul and charm and feeling of the first one while including aspects from the Kipling stories and changing it from a G-rated musical to a PG-rated adventure that would have more thrills and be more exciting and scarier at times than the original, but also maintain the heart and the humor and the music too,” he said. 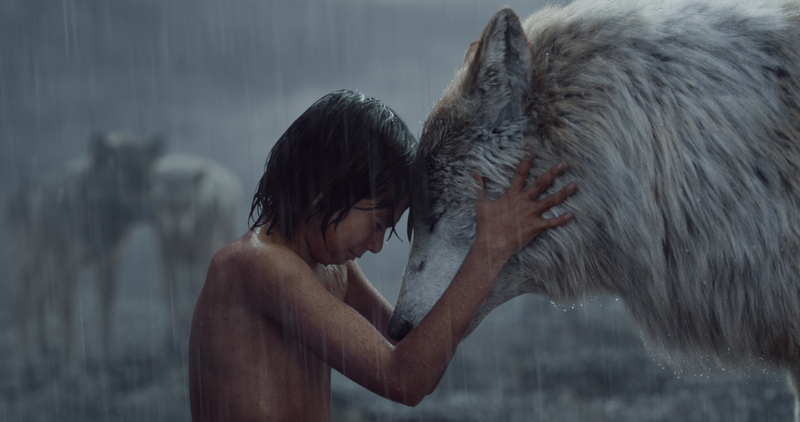 Joined by cast members Kingsley, Sethi, Esposito and Nyong’o, the group spoke to the press about their involvement with “The Jungle Book” and reimagining a film classic as well as honoring the original work of Kipling. Kingsley: Every filmmaker brings his or her taste to the project and I knew Jon well enough and I’m fond enough of him to know that his perception of humanity and childhood and storytelling completely coincide with mine, so it was a joy to join this beautiful project of his. Nyong’o: He very quietly walked me through his idea of this version of “The Jungle Book.” What struck me was the compassion with which he was talking about these characters. There was all this state-of-the-art stuff he was going to do with it, but at the heart of it was this love of the story and a real vision for each character he was going to bring to life. That’s what brought me to it. Favreau: It was kind of surreal because the script happened to be (Esposito as) a parent reading a bedtime story and he was reading “The Law of the Jungle,” from “The Jungle Book.” It was something set in the future with an old book and I remember him reading, “The strength of the pack is the wolf and the strength of the wolf is the pack.” As we were developing the script for “The Jungle Book” a year or so later, I remembered him reading that when we’d worked together, and I said that’s the guy we need for Akila. He’s the one who’s passing the law down to the next generation of wolves. It’s weird how these things happen. It’s hard to imagine there’s not some guiding force to the way things are. Sethi: I didn’t have to go through a lot of auditions. It was just one, but Jon really liked me so we flew to L.A.—me and my family—and we had lunch with him. That was really big. When my mom went to the bathroom, he said to me, “As far as I’m concerned, Neel has the part.” And everybody was like, “What?? ?” My mom was in the bathroom. She was like, “Wait! Hold on.” She came back and said, “Could you say that again?” It was amazing and the food was really good. It felt like it was too easy. That shouldn’t have happened so easily—I auditioned once and then getting the part. Favreau: We were panicking (during the audition process for Mowgli), because I knew I needed someone to anchor, emotionally, the whole story. And we needed somebody who was compelling and the audience can relate to and enjoy watching for an hour and a half, which is a lot to ask of any actor. It was a big deal what Neel was able to do and a testament to the actors and crew. He was the center of attention. It was a big chunk of his life. Favreau: When it ended it was like when camp’s over. It’s bittersweet. Sethi: The first time I met Sir Ben Kingsley and Lupita Nyong’o, I voice-recorded with Sir Ben and I met her at D23. That was a lot of fun. I got to see my (animated) face. Favreau: I tried to get (the actors) to perform as much together. I directed animated voices before and eventually it begins to degrade to, “OK, just say it again, only louder.” Depending on the filmmaker, they either use the loudest take because it has the most energy and it wakes up the children in the audience, but you don’t get the subtlety of a performance. It’s a lot to ask of people. I wanted this to feel like a live-action film and not an animated film, and the key was to get a conversational performance. I know, from being an actor, that you rely upon your scene partner and the energy of the scene partner modulates your energy. It’s like a tennis match with the person you’re in front of the camera with. Luckily, Neel came with me whenever I went to different locations. Sir Ben is the first person Neel worked with and, of course, he’s a wonderful teacher, mentor and experienced thespian so passing good habits on to the next generation, which worked so well with the relationship onscreen, and with Bill Murray and Christopher Walken, I tried to get combos, so that I would have reference for the animators to work from. Kingsley: The secret to my performance I discovered later, which is odd. But I had an intuitive grasp of something in him and I realized much later that I actually am playing Kipling—that Bagheera is the voice of Rudyard Kipling in the story, and the narrator. Tragically, he lost his son during World War I. We were talking about coincidences and some kind of benign matrix in which we’re all mixing here, and it’s definitely the spirit of Kipling. After working with Jon, I had the opportunity with my son, Ferdinand, where we reading letters between him and his son in front of an audience. I realized whilst reading it with my son, that Bagheera is Kipling. Sometimes an actor’s intuition is buried and you don’t realize what you’re mining as a source of energy until afterwards but I’m privileged to be the voice of Kipling, a man I greatly admire. Also, I was in the cub scouts, and our troop leader was called Akela (the same name as the wolf pack leader in “The Jungle Book”). Reading the book as a child made a difference for me. It allowed me to dream and dream big. It allowed me to have courage. For me, I always wanted to be Mowgli as a boy because there was a freedom within that, the freedom to be able to express myself the way I always wanted to. I found that freedom through being an actor. Seeing (the original “The Jungle Book”) did something else to my imagination. It allowed me to understand how we create relationships with each other and how those are relationships we can really hang on to. I didn’t know what Jon would do in the room but he’s a challenger and he challenges in a very graceful way for you to do something very different. I’m just a channel for this particular character that has to bring some love, compassion and yet some tough love to this young boy. Nyong’o: “Star Wars: The Force Awakens” was my first attempt at doing motion-capture, and this is my first voiceover role. I was attracted to it because Raksha is like the eternal mother. She chooses to take care of this creature that is not one of her own but as though he was. I remember I did a session really early on and a few months later Jon called me in again but this time he had Neel’s performance motion-captured, and that really grounded the mother-son relationship for me. To see the vulnerability of this boy and the love he had for the wolf, it only made my love for him grow. It’s beautiful to see these very different creatures have this very real bond. My mother had a lot to do with what inspired me because she’s my example and she’s a very good mother. I asked her what it would be like to lose one of my own. I don’t have any children myself but when I was 12, I preferred to stay indoors and babysit my cousins than go outside and play. There’s that part of me that is very much alive; I gravitate towards children. Kingsley: If you are blessed with children, you have to adapt to each child and each moment. You have to be very pragmatic as a parent. It has a lot to do with the tension and responding to the ever-changing complexities of a child’s needs and address them moment by moment rather than have a set of rules. Esposito: I’m finding with my four daughters, as a parent you want to do all the right things for them. And then you look at them one day and you see that they’re already formed. That’s the moment it clicked for me that they’re each very different. I look at them that way and I listen to them and their needs equally. It’s made me grow as a parent because I now have very distinct relationships with each one, not based or predicated on the one I had before. Favreau: I agree, and certainly Baloo appreciates that you’ve got to be who you are and you have to give yourself room, but there is room for a different style of parenting and storytelling, which is, what are the traditions, what are the myths of a culture for? They’re to try and help the younger generation not have to learn lessons painfully because you can learn them through visualization and through story. Rule systems are an effort out of love to save the next generation from the pain the older generation goes through. To explain to them that stove is hot so that they don’t touch it. Of course, that’s a fantasy. They have to learn on their own as well. That’s the strength of a culture, which is to give them a context in which they can visualize their struggles as they persevere and come out the other side. It’s easy to fall in love with (Baloo) a bear that sings; that’s the one I remember as a kid but as I’ve become a parent and have three kids, I now realize the others are out of love as well. You do the best you can. Ultimately, we’re all a combination of the two. In this, we have three father figures and one mother figure, it’s really a deconstruction of what parents are and there are elements of all of them. They all represent different aspects of what goes on in our brain. So as a parent, sometimes I’m Bagheera, sometimes I’m Baloo, sometimes Akela and sometimes Raksha. Sethi: Before this, I didn’t climb that much because I was raised in the city (New York). In the movie, it looks like I’m climbing but I could only be 30 inches off the ground. It looks like it’s far down but it’s really not. Favreau: He’s being modest. We put him through the paces with the stuntman before we hired him to see what type of athlete he was. Neel’s actually great in a lot of sports. So when I’d direct him, it was more like being a coach. I’d tell him, “Pretend like you’re going to steal second base.” So when you see running away from the cattle in the stampede (scene), he was stealing bases. I got an incredible sense of focus out of him. This guy was the pivot point of the entire film. Favreau: It was to not to drop the ball for the people that love this property, and knowing, inherently, I couldn’t just take the G-rated musical and make it photo-real. How much music could you have and not turn it into a musical? How could you incorporate the music that taps into the subconscious of the audience members that grew up with it through triggering it in the score and triggering it by covering a song in the end credits? How do you have it emerge so it doesn’t break the reality of the story? This is something we discussed for years. We all discussed it—the Disney team. Thanks to John Debney, my music composer, we could re-orchestrate the songs until it feels of one thing. I have to say the biggest contribution to all of this was John Debney, our composer. He had 110-115 musicians (in the recording studio) playing together and reinterpreting (the original music) and putting a human element in the vibrato, in the way the string instruments were bowed. The horns. It unifies the whole thing like a complete dish. Favreau: We’re excited about the (good) responses we’ve been getting. We worked hard and poured ourselves into it. It’s a communication tool. It’s not a painting you put on your wall. It’s a conversation we’re having. It was part of the culture before we decided to update it. So this has been an exciting couple of days as people are seeing it for the first time.